Raleigh Specials Tonight: St. Paddy's Is Finally (Basically) Here! St. Paddy's Is Finally (Basically) Here! Welcome to my favorite weekend of the year - St. Patrick's Day! Amy is so nice to let me always post right around the holiday of my people, and I have a couple of great ideas for you today. Since it's Saturday, this will be when to be out and about, starting with Raleigh's official celebration: St. Patrick's Day Parade and the Wearin' O' the Green Festival! Everything kicks off in Moore Square at 10:00 this morning, and the parade is at noon. It'll wind through downtown, going up Fayetteville to the Capital and then back down to Moore Square to continue the green-wearing. 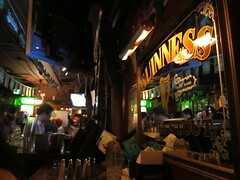 And, obvi, Tir na nOg is right there, so you know there will be some authenticity going on. Speaking of our beloved local Irish pubs, you're probably wondering what Raleigh will do without Hibernian on Glenwood this weekend. Fortunately, we don't have to do without because they're closing down North St. to have their annual block party! Just because the bar is out of commission doesn't mean we can't throw down with beer, food trucks, and live music, so hit that up any time between 11:00 and 11:00. And as always, please be safe and get a cab if you need one. We need you bright-eyed and bushy-tailed tomorrow for actual St. Paddy's Day!